After series of training dives and a bout of bad weather offshore, July 26 was the first dive day on the Monitor. Objectives were kept simple. Divers were to obtain some overall video of the site to give us a permanent record of the current conditions of the wreck. At the evening meeting July 25, the route for video passes was laid out using a wreck model and site maps. Everyone was anxious to see the first glimpse of the Monitor in almost a year. One aspect of the Monitor that has long eluded researchers is a definitive image of the vessels pilothouse. The angled sides of the modified pilot house are visible in this historic potograph of the USS Monitor taken by James Gibson on July 9, 1862. The Monitor's iron pilothouse was located near the bow of the vessel. 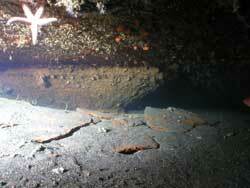 In its inverted position, the lower edge of the port armor belt is barely a foot off the seabed. 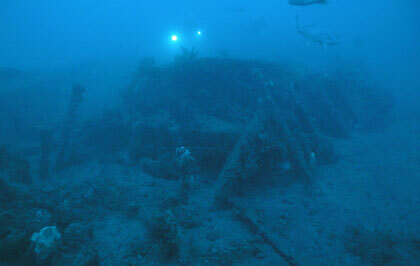 The deck underneath, where the pilothouse was mounted, fades away into the sand. The rectangular pilothouse that John Ericsson designed for his warship was damaged during the Monitors epic battle with the CSS Virginia (ex-USS Merrimack) on March 9, 1862. Soon after the battle, the crew modified the pilothouse with an angled glacis that gave it a pyramidal appearance. The angled sides helped to deflect shot making the structure a harder target to damage. 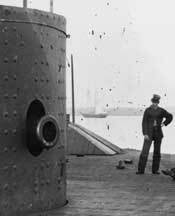 This is the pilothouse that appears in the few existing photos of the USS Monitor. 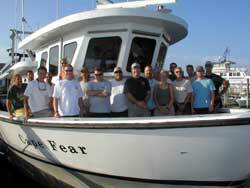 The dive team headed out of Hatteras on the R/V Cape Fear for the first time early on the morning of July 26. At the dive briefing the night before, Rick Allen of Nautilus Productions was designated cameraman for the first dive. He was assigned to record lateral passes along the port armorbelt, around the starboard side of the ship to the stern, and to obtain overhead views of the stern and the boilers. Once the dive had been completed, Monitor National Marine Sanctuary staff and the dive team discussed the dive aboard the Cape Fear on the way back to Hatteras. When it was Rick Allens turn to contribute to the debriefing, he relayed to everyone that the bow area was close to what had been described to him except that the area, even though still close to the sea bed, looked like it had been scoured out. Allen said he was able to get his camera and lights in and up under the armorbelt and thought the MNMS team would be pleased with what he had filmed. Back on the beach, the team scattered to finish up the tasks of the day. Divers went off to refill tanks for the next dive and MNMS Archaeologist Tane Casserley and Johnston went to review the digital stills and video from the dive. Reviewing the video, they followed Allens course along the wreck. When he was almost at the bow, he dipped down and began panning along the area under the armor belt. The first thing they saw were a few dislocated deck plates hanging down from the hull and disappearing into the sand. Plating! It appeared at first that the pilothouse had eluded them again. Then, as the camera continued to pan toward the bow, there in the background was the definite outline of the angled side of the Monitors pilothouse! These were the first conclusive views to date and Casserley and Johnston were thrilled to finally see it. On a subsequent dive, the team will attempt to obtain additional video and still images of the area. The Monitor never ceases to surprise the team with what she reveals.